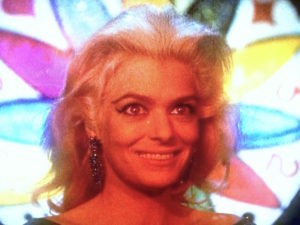 Melina Mercouri is Elizabeth in Topkapi (1964). IMAGINE A BEAUTIFUL and passionate woman who lives for beautiful objects — especially emeralds. She exudes such a joie d’vivre that men flock to her. With beautiful makeup and hair, an infectious laugh and freely bestowed kisses, she uses her power to persuade men to help her get everything she wants. Topkapi is the treasury in Istanbul where the priceless jewels of the Turkish empires are kept. In this film, two protagonists devise a caper to get their hands on a particular item in the Topkapi treasury. 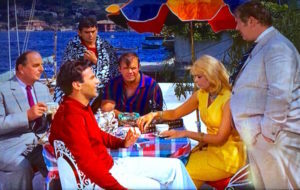 Walter Harper (Maximilian Schell) and Elizabeth Lipp (Melina Mercouri) decide to steal an emerald-studded sultan’s dagger, since emeralds are Elizabeth’s best friends. To help them pull off the caper, they plan to assemble a team of amateurs. This is to decrease the likelihood that a dossier already exists on a team member in a police bureau somewhere. 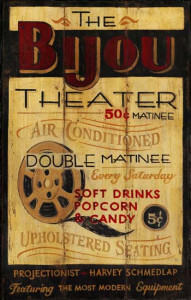 The film opens at a carnival. 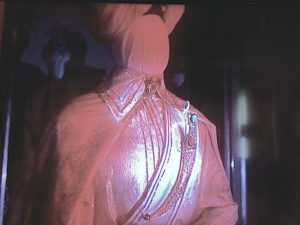 Psychedelic colors filter across the screen in a surrealistic fashion, giving an effective air of mystery to the story’s introduction. The two conspirators recruit a strongman, a gymnast and a carnival worker. The first recruit is Cedric Page (Robert Morley), who appears to be a bumbling toymaker. But Cedric is actually an amazing inventor and alarm expert. He determines that the floor of the Treasury is loaded with hundreds of strain gauges. This means that the slightest weight on the floor after closing hours will set off the alarms. Elizabeth and Walter also recruit a driver, Arthur Simon Simpson (Peter Ustinov). Arthur works in a Greek border town as a guide-for-hire. Though Arthur has lots of British and American tourists to solicit, his limited skills will never make him prosperous. Walter and Elizabeth hire Arthur to drive a Lincoln across the Turkish border. Arthur has no idea about the caper or the real identities of Walter and Elizabeth. He just thinks they are a jet-set couple with an expensive car. They give Arthur directions to drive the Lincoln to Turkey and leave it at the Istanbul Hilton. The guards at the Turkish Border are suspicious of Arthur, so they check the car so thoroughly that they almost dismantle it. The search pays off — they find weapons and Arthur is immediately taken into custody. The Turkish security force suspects that a terrorist group has set Arthur up, so they appoint him as an agent to try to find out more. Arthur then sets out to join Elizabeth’s team in Istanbul. In one fascinating scene, the plotters attend a wrestling match in an Istanbul stadium. This once-a-year event is quite a spectacle as musicians march around tangled masses of writhing, oiled male bodies. The spectators are totally mesmerized with the scenario, so the caper team uses this to their advantage to advance some of their plans. Will Arthur fall under Elizabeth’s spell and help her with the heist or will he help Turkish security? Will the team find a way to slow down the lighthouse beam that sweeps the Topkapi palace roof every 21 seconds? How will they use Cedric’s mechanical parrot that perfectly records human speech? How will they make a key for the sultan’s display case? How will they get to the display case without triggering the floor alarms? Will the fabulous Elizabeth get her emeralds? Only the amusing and mysterious Topkapi holds the answers. Theoni V. Aldredge was the costume designer for this film. Melina Mercouri is riveting in her coordinated outfits. In these days of minimalism and capsule wardrobes, I’m still inspired by a total matched outfit. Her fingernails even match. I didn’t know anyone with green nail polish in the 1960s!